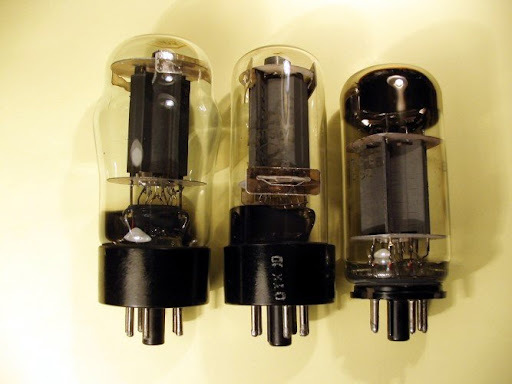 6L6 vacuum tube has been introduced by Radio Corporation of America in July 1936 and since 1937 it began to be produced in the USSR on equipment provided by RCA. 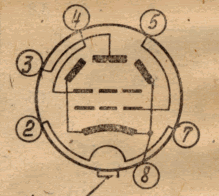 For the first time it was usual metal 6L6 , but later was chosen glass bulb design in order to avoid overheating, so just before the WWII tube factories started to produce 6P3 (6П3) valves (left on photo), which was actually Soviet version of 6L6-GB tube. After the forties, design has been changed (center tube on the photo) and the new one got additional "S" mark, which meant "Oktal" according to the post-war standard specification. There was some modifications such as 6P3S-E (6П3С-Е) (at the right on the photo) and 6P3S-EV (6П3С-ЕВ). I heard a lot of controversial stories about these extra letters, but according to the GOST it is Durability (E) and Reliability (V), so 6P3S-EV is just a high mechanical quality version of general 6P3S (6П3С) with warranted lifetime, probably military or industrial purpose. 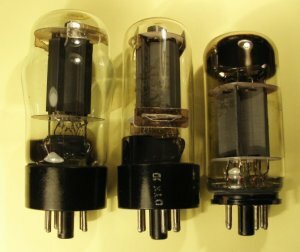 As for claimed electrical parameters, these 6P3S-E (6П3С-Е) and 6P3S-EV (6П3С-ЕВ) tubes has less current and voltage deviations than common 6P3S but according to my subjective opinion WWII 6P3 tube was a best performer in this family. Grid to Plate Capacity 1 mmfd. Thanks for this handy opinion. I have some 6P3S idling at 442V Plate, 441 Screens 13.6W and they seem to hold out okay, but they do creak and groan a bit on power down. What is your experience with running them at higher voltages? Is there a Va(max) spec for the 6P3S? Hi there. I think that all these creaks is not a big problem, but I've never tried to force this baby too much, no more than 420 Volts. Why? Just because of 807 tubes - it should be much better to use that ones on the higher voltages.